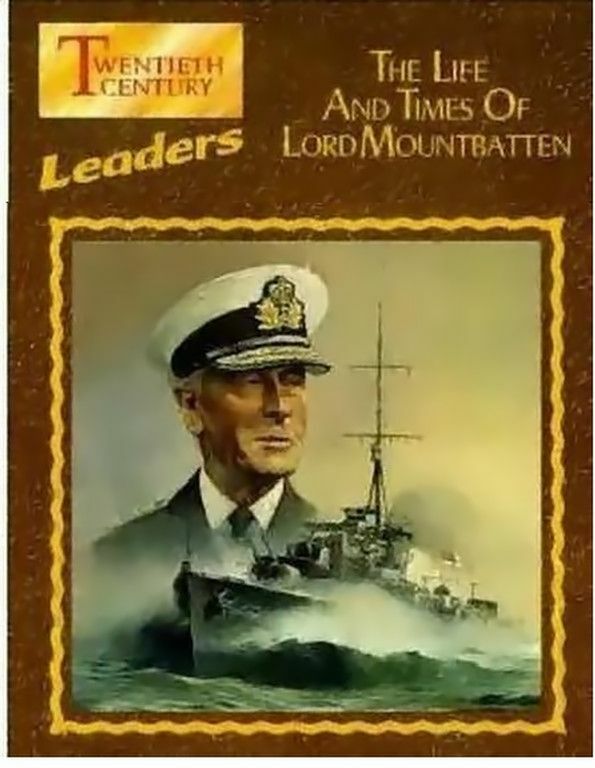 Relieve the 20th Century through the eyes and words of Lord Mountbatten - a member of the Royal Family and one of Britain's most highly decorated naval officers. Here, Lord Mountbatten narrates his life story using a wealth of historical material from the archives of the world - including much from his own personal collection. This extraordinary 12 episode series spans 70 years of triumph, conflict and glory in the life of this remarkable man who rose to worldwide recognition as both statesman and military hero, yet was tragically assassinated in 1979. It is this tremendous sweep of international events and changes that has been recaptured in ths unique series. Unique because it is not only about, but with the man concerned. The production team, including Lord Mountbatten, revisited many of the locales in which his career was formed - Malta, Burma, Ceylon, Singapore, India. Excerpts have been incuded from many of those whose lives and duties infuenced those of Lord Mountbatten, or were influenced by him. They include the Duke of Windsor, Prince Philip, six former Prime Ministers, General Eisenhower and other key figures in world history. The introductory episode of the series, dealing with the years 1900-1917. Setting the tone for the series of personal reminiscences (related by Mountbatten) against a more general history of the times (narrated by Mango), this episode charts Mountbatten's early years (from his birth in 1900 to the beginning of his naval career serving as midshipman under Beatty on HMS Queen Elizabeth) and his family's position in relation to the Great War and its origins. The Dreadnoughts, Gallipoli, the Battle of Jutland, U-boats, conscription, form the background to the resignation of Mountbatten's father, Prince Louis of Battenburg, as First Sea Lord, and the Battenburgs' change of name (to Mountbatten) as the result of anti-German feeling, at which point "the Mountbatten story can be said to begin." Mountbatten describes his ties with the Russian Imperial family, and the shock felt by the British Royalty at their deposition and eventual murder. With the entry of USA into the war, Mountbatten visits the Western front with Haig (not shown), before the July offensive leading to the armistice. Mountbatten, "looking forward to having some fun" after the restrictions of wartime naval life, spends two terms at Cambridge before accompanying the Prince of Wales on his 1920 world tour. On his return he is put in charge of a small naval force during the 1921 state of emergency, and then on HMS Repulse, at the time of the death of his father (reinstated as Admiral of the Fleet). Mountbatten is invited on the second Prince of Wales tour, which takes in India, where he discovers the pleasures of polo, and proposes to Edwina Ashley, whom he marries on his return. Their honeymoon is spent at Broadlands (her family home), in Europe and in America. Their stay in Hollywood (at "Pickfair") is recorded in a "home movie" made by their host Chaplin, and involving the house guests. Mountbatten resumes his naval career in 1923 on HMS Revenge in the centre of the storm over the confrontation at Chanak, after the collapse of the Greek army against the Turks, the abdication of King Constantine and the exile of Prince Andrew, Mountbatten's brother-in-law. Mountbatten specialises in signals, produces a series of "newsreels" on board Revenge, indulges in polo, starts a family (his first daughter is born 1924), then moves to Portsmouth as a signals instructor in 1929. Meanwhile the French enter the Ruhr, nationalism begins to take hold in Germany, and the General Strike, the hunger marches and the Invergordon mutiny occur. In 1934 Mountbatten takes his first command (of HMS Daring and then HMS Wishart) and finds himself in Malta during the Italian invasion of Abyssinia; he then returns to England to the Naval Air Division. A bad time for Mountbatten as for others: the death of George V; the abdication of Edward VIII; the war in Spain; the Japanese invasion of China; the failure of the League of Nations; the policy of appeasement leading to the resignation of the First Lord of the Admiralty and of the Foreign Secretary (Mountbatten was also not in favour); the death of Mountbatten's brother George, the Marquis of Milford Haven; the German and French mobilisation; the dispute over the control of the Fleet Air Arm, which the Navy eventually wins. Mountbatten becomes captain in command of the 5th destroyer flotilla in June 1939, taking command of HMS Kelly. Filmed at the Kelly reunion dinner in 1966, he describes the torpedoing of Kelly and the successful attempt to tow her back to harbour during the April 1940 raid on Norway, and her subsequent sinking after complete refitting in May 1941 in the evacuation of Crete. Mountbatten goes to the USA to take command of HMS Illustrious at the time of the Atlantic Charter, but his command is cut short by his appointment as Adviser on Combined Operations (taking over from Admiral Keyes), and he is thus involved in (among others) the commando raids on Vaagso and St Nazaire. He then become Chief of Combined Ops, is made an acting Vice Admiral, an Honorary Lieutenant General and an Honorary Air Marshal. With the entry into the war of the USA, pressing for an early offensive, and the creation of the combined Chiefs of Staff, Mountbatten befriends Marshall and helps to ease the strained relations between the Allies. The Dieppe raid teaches Mountbatten and his colleagues valuable lessons and prepares the way to the North African landing of November 1942 (Operation Torch). Mountbatten attends the Casablanca conference, and then at the Quebec conference he is appointed Supreme Allied Commander, SE Asia. Mountbatten takes up command in SE Asia in August 1943 (the film gives a brief resume of the events in the far east up to that point) and sets about raising morale by touring his command and introducing himself and his plans to his troops, and by launching a SEAC newspaper. His first plan for a seaborne attack on the enemy's flank falls through due to the withdrawal of equipment for the European campaign, and he is forced into a land attack from the north. The Japanese attack and their encirclement of Imphal and Kohima provides the British (eventually) with their first victory, partly through Mountbatten's use of air supplies, and he decides to fight on through the monsoon, reaching the Irrawaddy in early 1945, and crossing it in the boats built by Slim's forces. They take Mandalay in March 1945. In this episode, Mountbatten pays tribute to the commanders under him, Stilwell, Wingate (rather modified praise) and, in particular, Slim. The Fourteenth Army attempts to reach Rangoon before the onset of the monsoon, and arrives in early May. A victory parade and a naval review are held in June. A final amphibious operation is planned but again is thwarted by lack of equipment. Mountbatten has his first experience of the rising nationalism in SE Asia - the Burmese request the reinstatement of a Civil administration and he reluctantly complies. While the US forces in the Pacific advance slowly, Roosevelt dies (Mountbatten remembers him as a friend), and the Potsdam conference is held, at which Mountbatten's sphere of command is increased and he is told to prepare for the Japanese surrender after the atomic bomb. Meanwhile Churchill is voted out of office (rather to Mountbatten's disappointment) and Attlee takes over at the conference. The re-occupation of Singapore (and relief of the POWs) is delayed after the Japanese surrender until the formal ceremony in Tokyo; Mountbatten eventually takes the official surrender of Singapore on 12th September. With the end of the Far East war and the resulting chaos, Mountbatten's priority is the liberation of POWs, in which he is greatly helped by Lady Mountbatten. He also makes the unpopular move of using the many remaining Japanese as police. Mountbatten increasingly becomes involved with political problems: in Singapore with anti-British demonstrations and strikes led by the communists; in Siam, where Mountbatten hopes to retain the monarchy; in French Indo-China, where the British initially help to keep order; in the Dutch East Indies, where the British in the middle of the Dutch-Indonesian conflict experience their worst problems. Mountbatten saves Nehru's visit to Singapore from disaster by taking charge personally, and then makes a successful Australia and New Zealand tour with his wife. He hands over governorship to MacDonald in May 1946 and returns to England to receive the Sword of Honour and Freedom of the City of London, to become Earl Mountbatten of Burma and finally a Knight of the Garter. Mountbatten returns to India as Viceroy and, faced with the increasing unrest and anti-British feeling, insists on having plenipotentiary powers. June 1948 is initially suggested as a time limit for India's independence. Mountbatten becomes firm friends with Gandhi and Nehru but finds Jinnah less approachable, and with trouble brewing in Bengal and Punjab and other provinces, he reluctantly opts for partition. The agreed plan is eventually drawn up and the date for independence and partition brought forward to 15 August 1947. Mountbatten's team race to complete the arrangements and try (for the most part successfully) to persuade the Princes to accede. On 13 August Mountbatten with his wife travels to Karachi to join Jinnah at the assembly, in spite of a bomb threat. As midnight approaches on 14 August, Nehru addresses the assembly in Delhi. Mountbatten is sworn in as India's first Governor General and is immediately faced with the severe problems caused by partition. Nehru's government elects him as chairman of an emergency committee to tackle the worsening situation, which eventually improves, but the failure to accede of three states, Kashmir in particular, causes a permanent problem. In November 1947, Mountbatten returns to England for the marriage of his nephew Philip to Princess Elizabeth. Back in India he attends the funeral of Gandhi after his assassination by a Hindu fanatic, and in June 1948 he hands over as Governor General to Rajaji Chakravarti Rajagopalachari and returns to a somewhat hostile England. Mountbatten returns to the Navy in Malta under the command of some of his former juniors, and sets about climbing the ladder to First Lord, via Vice Admiral, 1949; 4th Sea Lord, 1950; Commander in Chief, Mediterranean, 1952; and Commander in Chief, Allied forces, Mediterranean in 1953. He finishes his tour of command in Malta in December 1954. In April 1955 Mountbatten becomes First Sea Lord, and starts trimming the Navy down to a suitable peace-time force. In this episode, Mountbatten expresses some doubts about the Suez affair, while being pleased with the success of the combined assault itself. In 1957, he and the Minister of Defence (Sandys) reshape the Navy, which continues to be kept busy with the various emergencies around the world - Cyprus, Aden, Jordan etc. Mountbatten becomes Chief of Defence Staff in 1959 and brings about more sweeping defence changes in the face of strong opposition. In February 1960 his daughter Pamela marries, but, in the same year, Lady Mountbatten dies while on a tour of the far east. Mountbatten is persuaded by MacMillan not to retire in 1962, and he assists in the amalgamation of the three services under the single Ministry of Defence. He finally retires in 1965. The final episode of the series, summing up Mountbatten's career and his outlook. In this episode (the only one produced without Mountbatten's complete collaboration) Mountbatten's life today (1967) is presented - on his farm in Broadlands, talking with the Duke of Edinburgh; dressing up in full regalia as Colonel of the Life Guards; as Colonel Commandant of the Royal Marines; on "holiday" with his family at his seat in Sligo; and as a keen follower of scientific developments. Mountbatten is filmed at his home making (unscripted) remarks about his own view of his past achievements and his philosophy and approach to life. This page was last modified 00:42, 14 April 2019.